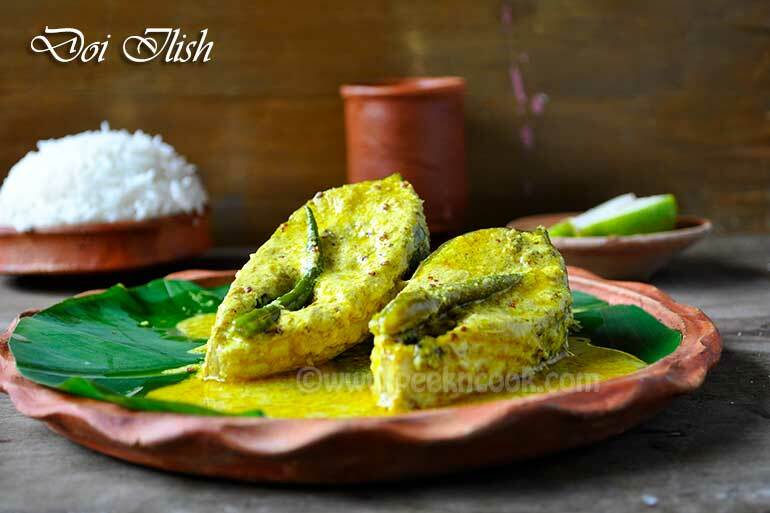 Doi Ilish is a typical Bengali Hilsa Recipe, where raw Hilsa fish is steamed in Yogurt and Mustured Sauce. Doi Ilish should be served with Steamed rice. First take the fish, wash with little water (Hilsa should not wash thoroughly, its taste will go by washing). Marinate the fish pieces with salt and 1 tablespoon turmeric powder and keep aside for 15 minutes. In the meantime grind the White mustard seeds with little salt & 2 green chills to a fine paste by adding 1-2 tablespoons of water along with it. Add 1 tablespoon of water to the mustard seed paste, mix it and add it to the pan. As you have already added salt in curd & mustard paste, you should not need to add anymore. But if you like to add, you may add as per your taste. Take the marinated Ilish, in a non-stick pan, add the musatrd paste, beaten yogurt, little turmeric, slit chilis and 1/2 cup water and marinate all together very gentely. Sprinkle the mustard oil on the marination. Adjust the salt to taste. If you like this recipe, please go to my Facebook Page & hit the like button for regular updates.